The Girdwood Community Hub site in north Belfast has been transformed in to a state of the art shared space, offering first-class leisure, community and education facilities. The site is being developed as part of our physical investment programme and also ties in with plans to transform our leisure services. The overall development is taking place over two phases. Phase one had a total value of £20 million with funding provided by EU’s Peace III Programme, Department for Communities and APEX Housing. We worked in partnership with Girdwood Community Hub Forum, the Department for Communities, Belfast Metropolitan College and Better Leisure on phase one of this project which incorporated the construction of the Girdwood Community Hub building and a multi-purpose sports pitch for soccer, Gaelic and rugby. As part of phase one, 60 new social housing units, provided by Apex Housing Association, were also built at Kinnaird Street. The Flickr gallery below shows how the hub looks. 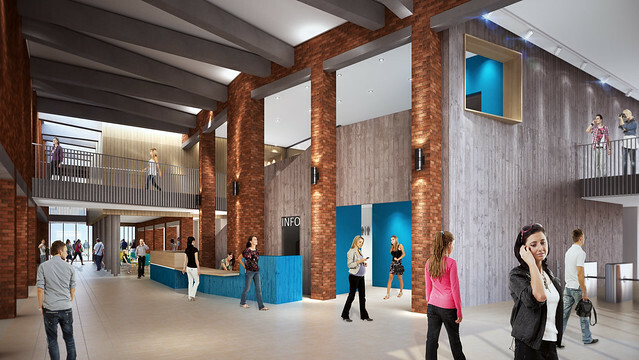 The video below looks at what the young people within the community think of the new Hub. Girdwood Community Hub is a place where you can access useful services and modern facilities in a shared, safe and vibrant environment. It's available for community, leisure or educational activities and initiatives. multi-purpose sports pitch for soccer, Gaelic and rugby. For more information on available courses at Girdwood Community Hub email communityeducation@belfastmet.ac.uk. The phase one development is the first step in the wider regeneration of Girdwood Park, a 14 acre site located between Crumlin Road and Cliftonpark Avenue. Several other developments are also planned to regenerate other parts of the site. These are led by the Department for Communities, who currently own the land, and are set out in the revised Crumlin Road Gaol and Girdwood Barracks Draft Masterplan. mixed use space for business units. These proposals are at various stages of development but, along with the hub, they will offer more social, economic and leisure opportunities for those living nearby and be a catalyst for wider development in north Belfast. Community Benefit Project of the year 2015, Property Excellence Ireland Awards.